Gutter cleaning time is here and as messy as that job can be, there’s little solace in knowing that once you are finished, you probably will need to do it again soon. Experienced property owners know that once a gutter gets clogged, a little wet weather will quickly lead to roof damage. Worse, a clogged gutter gets very heavy, and the weight will pull the gutters away from the house, which is both unsightly and expensive to repair. And this time of year, it doesn’t take long for gutters to get clogged! If you are scooping by hand, rig up a garbage bag on the ladder so you aren’t tossing debris to the ground — because if you do, you’ll have to pick it up a second time. Forget scooping out the gunk by hand–try a gutter-friendly power washer and blast out the dirt. Some are long enough for you to stand on the ground. Try out the new gutter cleaning robots– dirt-busting models are available for under $200. Invite a friend to help you watch for power lines, or bring you to the doctor if you break something. 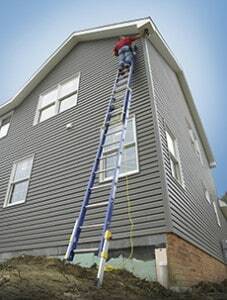 Consider upgrading to gutter guards.